Olivier Bernard is currently an Associate Professor at INSA (Lyon - France) and a member of the CREATIS-LRMN Laboratory (CNRS 5220, INSERM U630, INSA, Claude Bernard Lyon 1 University). We present here a new formulation of level-set where the implicit function is modelled as a continuous parametric function expressed on a B-spline basis. Starting from the level-set energy functional, this formulation allows computing the solution as a restriction of the variational problem on the space spanned by the B-splines. As a consequence, the minimization of the functional is directly obtained in terms of the B-splines parameters. We also show that each step of this minimization may be expressed through a separable convolution operation, which yields a very efficient algorithm. As a further consequence, each step of the level-set evolution may be interpreted as a filtering operation with a B-spline kernel. Such filtering induces an intrinsic smoothing in the algorithm, which can explicitly be controlled via the degree and the scale of the chosen B-spline kernel. All the images have an eight-bit dynamics and their dimension is 256*256. A cubic B-spline function is used as a basis for the level-set representation. The level-set is initialized using a circle centered on the image. 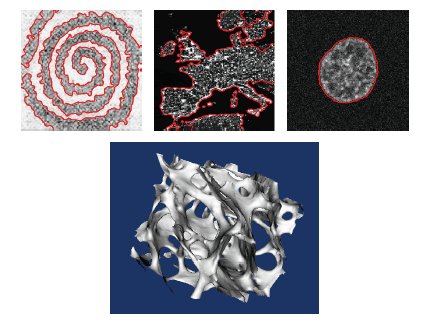 We give in the proposed paper a description of the results obtained for the images named: Spirale, donuts-Noisy-25dB, donuts-Noisy-20dB, donuts-Noisy-15dB, Yeast and Europe-Night-Lights.